Looking for a place to print and bind your portfolio? Already have your prints and looking for personalized binding? 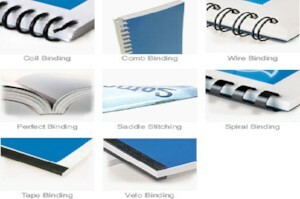 We provide you with several options for binding your material in the form best suited to your needs. The quick and effective wire bind is standard for many business presentations. A plastic velo-bind is a no non-sense way to get that first draft on the table. The comb bind is popular for the quick reference users guide. Let the printing professionals at Bestype work with you for customized printing and binding.